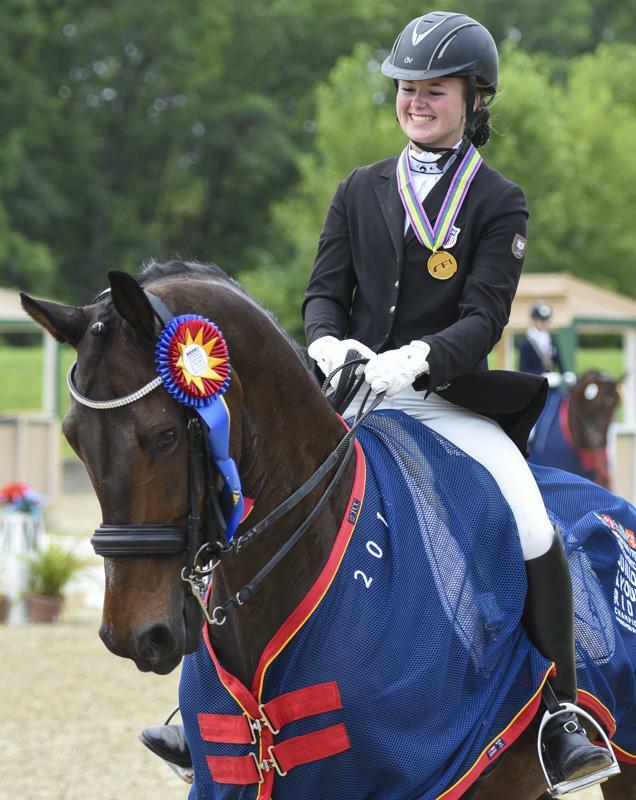 On July 23, 2017, Tillie Jones found herself on top of the podium at the Adequan®/FEI North American Junior and Young Rider Championships presented by Gotham North (NAJYRC) as the United States Dressage Federation (USDF) Individual Freestyle Dressage Gold Medalist. However, it came with no shortage of hardships along the way. This week, Tillie will face stiffer competition when she competes in the AGCO/USEF Junior Rider Dressage National Championships in Wayne, Ill. It is her perseverance and self-proclaimed love for the sport, along with support from family, friends, and her trainer that taught her embracing setbacks is the key to overcoming challenges and achieving success. Tillie Jones and Apachi at NAJYRC. Tillie developed a love for horses at a young age. While girls her age played with Barbie dolls, the Nebraska native acted out her equestrian dreams with “My Little Ponies.” For a special surprise on her seventh birthday, Tillie’s parents, Dallas and Tish, blindfolded her and took her to a local riding barn for her very first lesson. From there, Tillie began dressage lessons and stuck with it ever since. Tillie had her mind set on the NAJYRC since she got her first pony Darby at 10 years old. 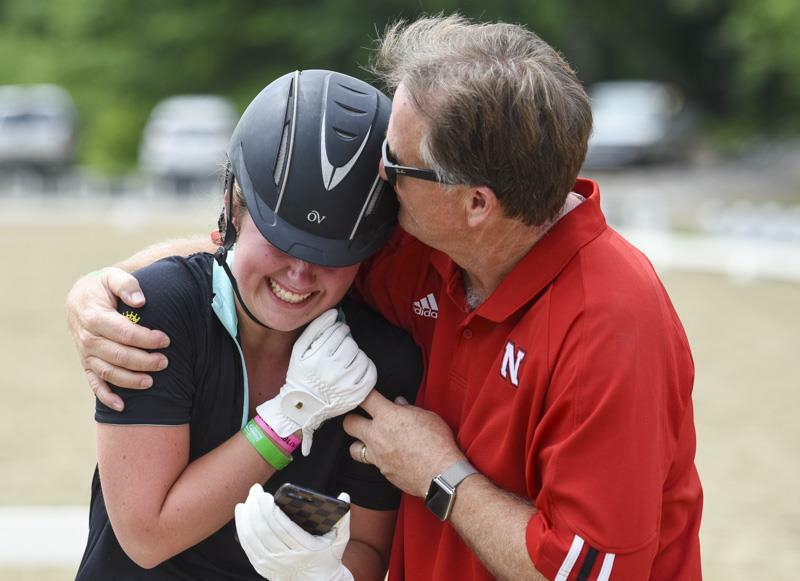 She looked up to girls from Nebraska who competed at NAJYRC, hoping she would follow their example one day. “I really looked up to those girls because there weren’t a lot of girls that qualified from Nebraska, so when a girl qualified I would really look up to them,” recalled Tillie. With that goal in mind, the Jones family purchased a schoolmaster named Boegley’s Mauricio, or “Mo,” in 2013 to help her achieve her dream. 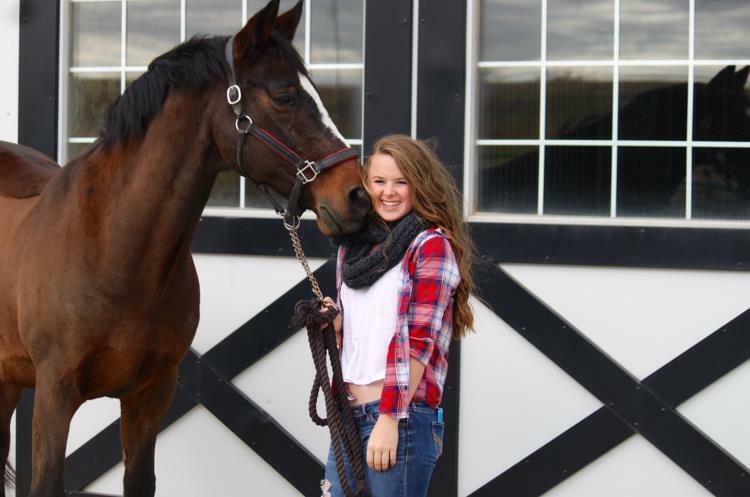 A few months later, one of every equestrian’s nightmares became reality as the barn she kept Darby and Mo in Hickman, Neb., caught fire and burned to the ground. Luckily, the horses got out unharmed but were emotionally distressed from the incident. The blaze destroyed every piece of equipment and tack. This forced the Jones family to sell Darby to pay for new tack and find a new barn to keep training at the same time. “This opened my eyes to a harsh reality of life that any ride may be the last,” said Tillie. After a long search for a trainer, Tillie landed with Jami Kment at Providence Farm in Lincoln, Neb. With Kment’s guidance, Tillie and Mo competed at the 2015 NAJYRC, respectably finishing in seventh and eighth. The momentum picked up for the combination as they continued to show at notable events throughout the remainder of 2015 in preparation for the 2016 Adequan/FEI NAJYRC. 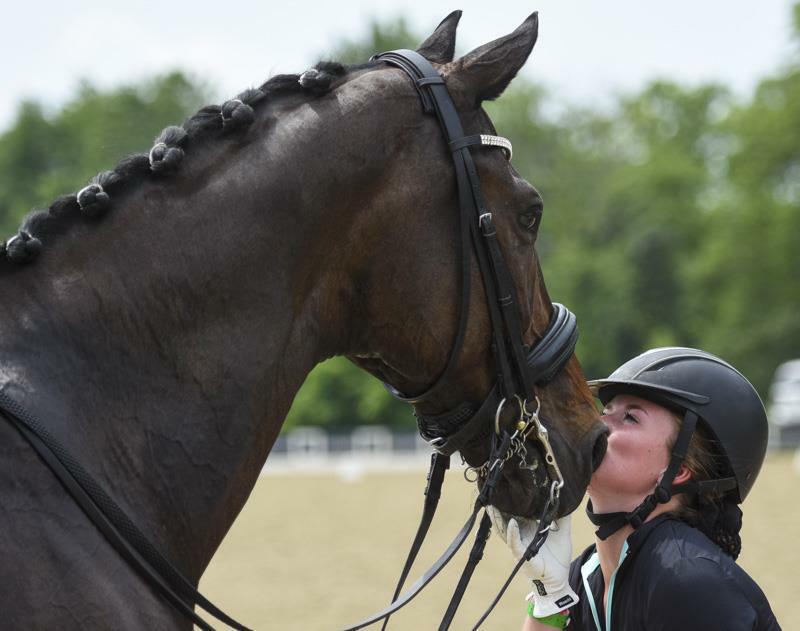 In April 2016, the hard work came to a halt when, two weeks before the first 2016 Adequan/FEI NAJYRC qualifying show, Mo started showing signs of colic. The Jones family trailered him two-and-a-half hours to Kansas State University’s Veterinary Health Center in case he needed surgery. After spending one week at the veterinary hospital without significant improvement and inconclusive tests, the doctors recommended surgery. Unfortunately, the veterinarians discovered that an entire section of Mo’s small intestine had died. On April 29, 2016, they euthanized Mo. The incident devastated the entire Jones family, leaving them in a state of shock. This especially upset Tillie, because she was on her way to see Mo the day the doctors euthanized him, the first opportunity she had to see him during the length of his stay. “When I got home from school expecting to get ready for the trip to see my boy, I was met with my dad’s open arms, tears welling in his eyes. … I never got to say goodbye to my best friend and tell him how much I truly loved him,” Tillie said. This gave her all the encouragement she needed to set the plan in motion. Tillie was determined to make it atop the podium in 2017 with Apachi and nothing was going to stop her from achieving this dream. The then full-time high school sophomore took a part-time job at Dairy Queen to help the family with expenses and to pay for a clinic with USEF Developing Dressage Coach and Olympian Debbie McDonald. Tillie felt getting the job was important because it gave her valuable perspective. “I don’t get everything handed to me; I have to work for it,” said Tillie. The teenager and her horse spent the fall and winter training, preparing for their first qualifying show in April 2017. Tillie trained for three months on her own as her trainer made an annual trip to Florida from January to March. “I thought it was cool that I could train him for three or four months and he could still improve while he was in my hands,” Tillie said. Tillie and Apachi placed second in their first-ever Prix St. Georges test and eventually qualified for the 2017 Adequan/FEI NAJYRC. 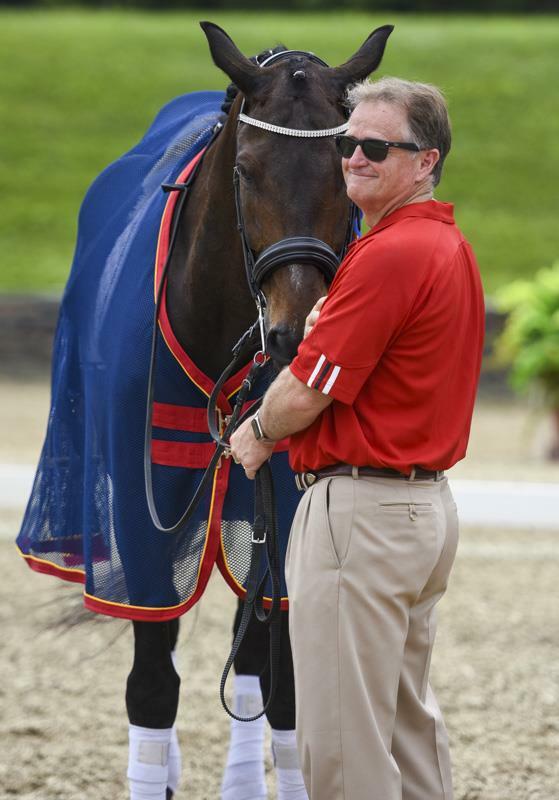 Then, two weeks before the 2017 Adequan/FEI NAJYRC, she received a phone call with devastating news. Apachi had colicked. Not wanting to take any chances, Tish Jones trailered Apachi to Kansas State University. “It was déjà vu,” said Tilly, who spent the entire drive to the clinic in tears. Seven hours in a car took a toll on her, and negative thoughts raced through her head. “I imagined what I would do if I lost Apachi,” she recalled. “What if I’d ridden him for the last time?” The fear gripped her body and sad memories held her mind ransom as she walked through the same veterinary hospital doors she had 14 months earlier. She found Apachi a few stalls away from where they had kept Mo. All the fear and worry vanished when the veterinarians told her Apachi would be okay. Three days later, they left Kansas State “not just with four shoes and some pieces of mane but with my boy, healthy and cleared to compete,” said Tillie. Dallas Jones embracing daughter Tillie. The combination only had two rides together before heading to Saugerties, N.Y., for the 2017 Adequan/FEI NAJYRC. “My dream of making the podium no longer seemed so important,” said Tillie. Having a healthy horse satisfied her enough. At the 2017 Adequan/FEI NAJYRC, Tillie competed in the junior division as an individual and on the Region 4 team with Apachi. On their first day of competition, Tillie and Apachi anchored Region 4 to an impressive bronze-medal finish. On the second day, the pair delivered a strong performance to earn an individual bronze medal. On the final day, she and Apachi performed their freestyle to the same music that Tillie had selected for Mo. “It’s super-emotional every time I ride that freestyle, because I know Mo is watching from above. … I really didn’t know if I was going to break down crying,” recalled Tillie. Dallas Jones holds Apachi while watching Tillie on top of the podium. Watch Tillie compete this week in the AGCO/USEF Junior Dressage National Championship this week at the USEF Dressage National Championships on USEF Network. This article is original content owned by US Equestrian and is not to be repurposed or redistributed.